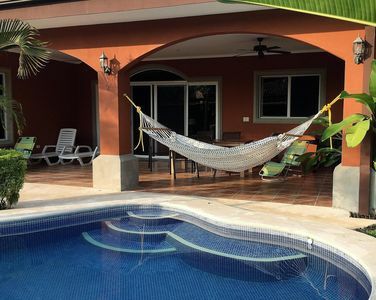 3 Bedrooms, 3 Bathrooms, Sleeps 6, Private Pool with covered outdoor dining area. 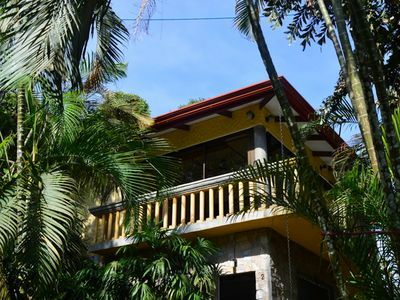 Welcome to Casa Marcelo! 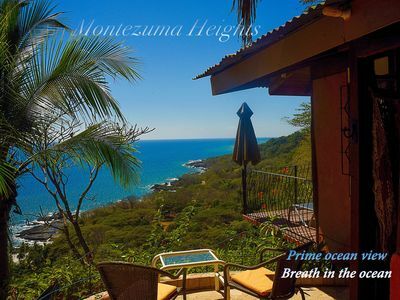 This beautiful, spacious, and comfortable vacation rental house is in the secured, gated community of Costa del Sol. Walk to the secluded tropical beauty of rich vegetation and palm trees that adorn the pristine volcanic black sand of Playa Bejuco beach. 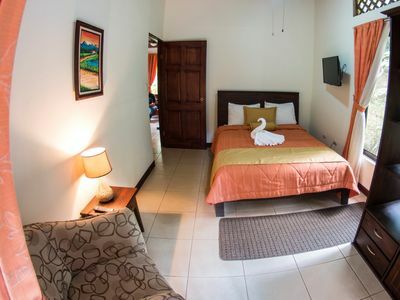 Casa Marcelo is located in the Central Pacific region less than two hours from San Jose’s international airport. 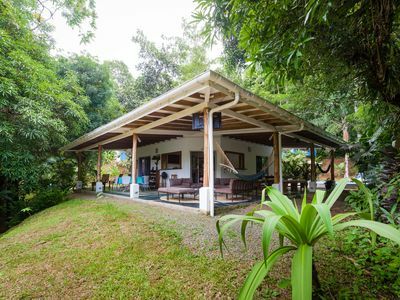 It’s also just 30 minutes away from the popular tourist town of Jaco to the north and 30 minutes from the famous Manuel Antonio National Park to the south. 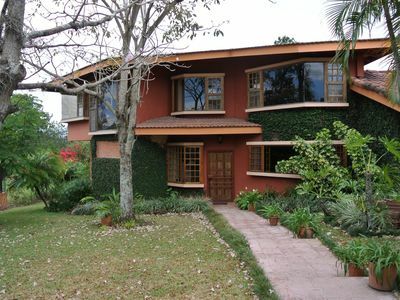 This 3 bedroom, 3 bathroom house is ideal for families, couples, and small groups. 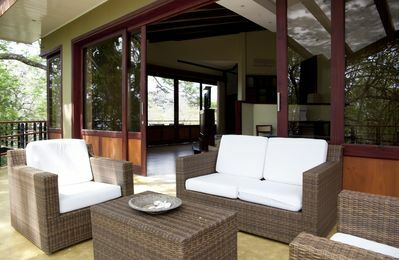 The home features an open floor plan with a large kitchen, living and dining area for entertaining friends and family. 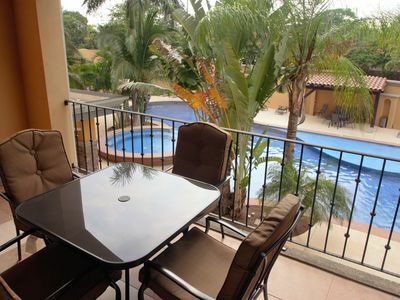 The back of the home opens up to a large covered patio area and private pool. 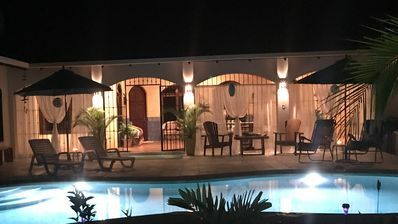 This newly built home is modern Mediterranean style, with amenities such as individually controlled air conditioning in every room, wireless high speed internet, dishwasher, refrigerator with ice maker, and washer and dryer. The well equipped kitchen comes with stainless steel appliances, custom-built cabinetry, cookware, dishes, utensils and a kitchen island with bar stools. It’s a perfect place to enjoy your meals. You may also enjoy a family dinner in the dining room with seating for six. 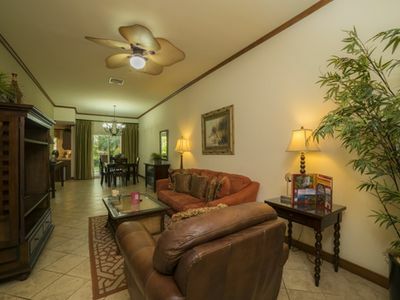 The living room has comfortable seating, a 37-inch high-definition TV, cable television, and high-speed Internet access. 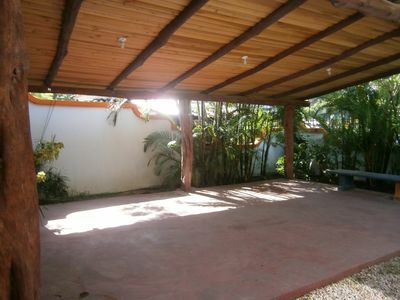 Enjoy lounging on the large covered patio while being cooled by ceiling fans. 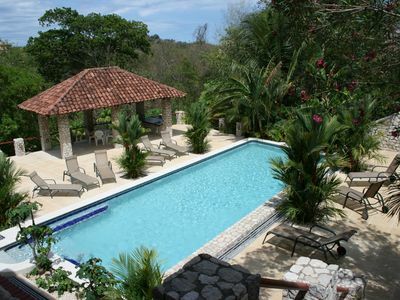 Relax while being surrounded by lush tropical landscaping, fruit trees and your own private pool. 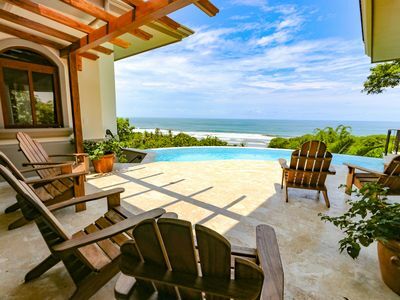 The patio is the perfect spot to drink your morning coffee, enjoy visiting hummingbirds, read a book, or just listen to the soft roar of ocean waves. The beautiful mosaic tiled private pool invites you to do nothing but refresh and relax. At night enjoy the ambiance of the beautiful illuminated pool while looking at the starry night sky. A conveniently located outdoor shower is great for rinsing off sand or just cooling off. 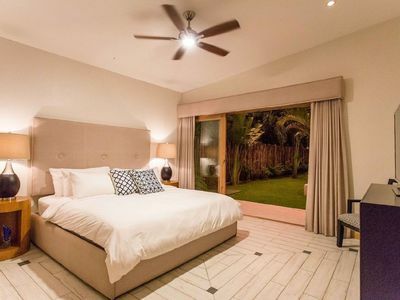 The Master bedroom has a King size bed with an over-sized bathroom with a shower and walk-in closet. 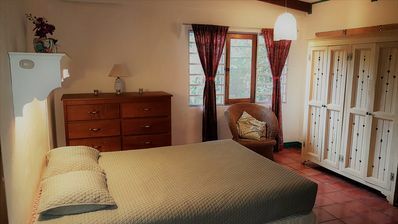 The second bedroom has a Queen sized bed with a large closet, and private bathroom.The third bedroom has two twin beds with ample closet space and, a private tub/shower combination bathroom. The attached garage features a remote controlled garage door opener and has direct access to the kitchen area. 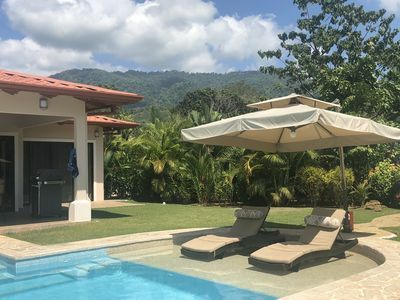 In addition to the amenities in the private home, the private gated community has two public swimming pools, a pool bathhouse, tennis court, BBQ rancho with Free Wi-Fi, and 24 hour security. 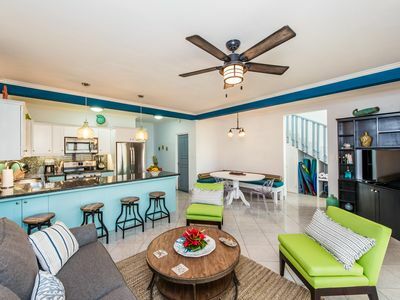 Take a dip in one of the tropical community pools; prepare some fresh catch on the grill in the large BBQ rancho, or enjoy a game of tennis on the community court. One of the most popular things to do is take a leisurely stroll along the uncrowded and beautiful Blue Flag-awarded beach of Playa Bejuco. Dig your toes in the black sand while hunting for colorful sea shells or just lay in a beach hammock and enjoy the ocean breezes. 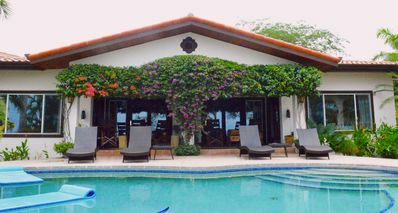 Don’t forget to bring a camera to capture and share the magnificent sunsets and other experiences at Casa Marcelo. For the adventurous, there are lots of nearby activities to keep you busy! Surfing, hiking, canopy tours, monkey tours, crocodile boat tours, horseback riding, ATV tours, golfing, and river rafting are just a few. 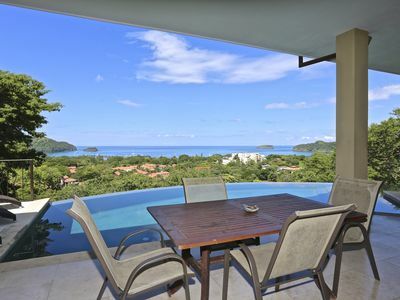 The sport enthusiast will love the fishing options available nearby in Quepos and Los Suenos Marina. Want to vacation in paradise? 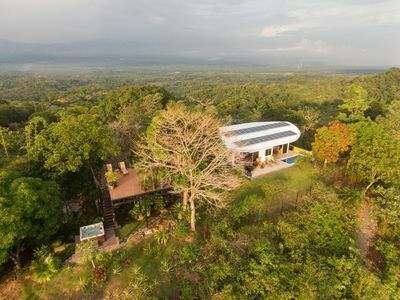 Stay at Casa Marcelo to experience Pura Vida! New Luxury Home, Walk to the Beach! 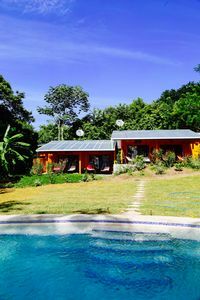 Best Ocean Views in Dominical!